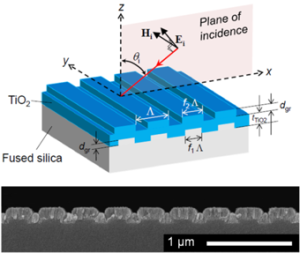 Moxtek has developed cost effective and reliable methods to obtain uniform wafer scale metallic and dielectric nanohole, nanopost, nanodome, and photonic crystal arrays. These can serve as optical biochip platforms for applications such as enhanced fluorescence, surface enhanced Raman spectroscopy, and label free sensing. A wide range of structural parameters can be tuned, allowing for customization to your unique needs. Brochure includes table of capabilities for biosensor fabrication. Moxtek has achieved low cost, wafer-scale manufacturing of nanodome arrays based on surface plasmon resonance (SPR) effects for surface enhanced Raman spectroscopy (SERS) applications, and is ready to support your production needs, from developmental projects through commercialization. Here, spatially averaged experimental SERS enhancement factors of at least 1.35 x 105 are demonstrated. Potential markets include food safety, pharmaceutical testing, forensics, and point-of-care diagnostics. 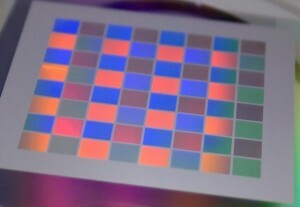 Moxtek has achieved low cost, wafer-scale manufacturing of photonic crystal structures for label-free sensing and microarray based surface enhanced fluorescence applications. Here TiO2 photonic crystal guided-mode resonance structures are presented, and showed a 7.7 fold average fluorescence enhancement factor when compared to a glass reference slide for assays of Human IgG, IgM, IgA, and streptavidin-biotin. The structure depicted below also produced a 2.5nm spectral shift upon binding of a self-assembled monolayer, thereby demonstrating the capability for detection of sub-monolayer thicknesses of adsorbates. Moxtek has developed cost effective and reliable methods to obtain uniform wafer scale metallic nanohole array patterned biochips. Here their use as fluorescence enhancing substrates for Cy3 based protein microarrays is demonstrated. The structures, utilizing highly focused and enhanced optical fields, greatly boost the fluorescence SNR, allowing for the detection of antigen concentrations 3+ orders of magnitude lower than current commercial standards.